"Sailor" George Fosdick, was born in Wisconsin January 14, 1885. He was said to have served in the United States Navy and Merchant Marines, hence the title "Sailor." Many tattooists earned this designation while serving in the Naval Forces. 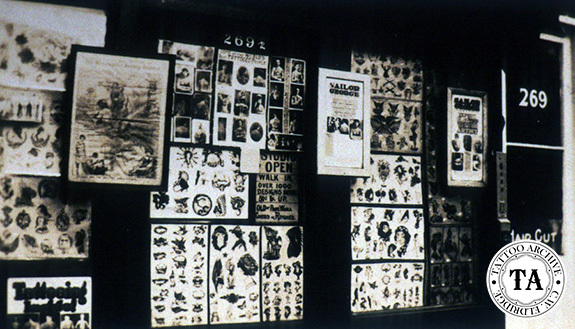 Fosdick came to Portland, Oregon around 1912 and set up his shop near the waterfront on Burnside Street, joining "Sailor" Gus and Charlie Weston on Burnside, both of whom were already established tattooists. It was only a few years later that a very young Bert Grimm took the trolley to downtown Portland where he would sell newspapers and hang out at the Burnside shops, cleaning up and running errands. Bert developed a friendship with Fosdick whom later became his tattoo mentor. In a 1981 interview with the Tattoo Archive, Bert recalled times in 1916 and 1923 when he and Fosdick would pool their money and at the end of the day, splitting it 50/50. 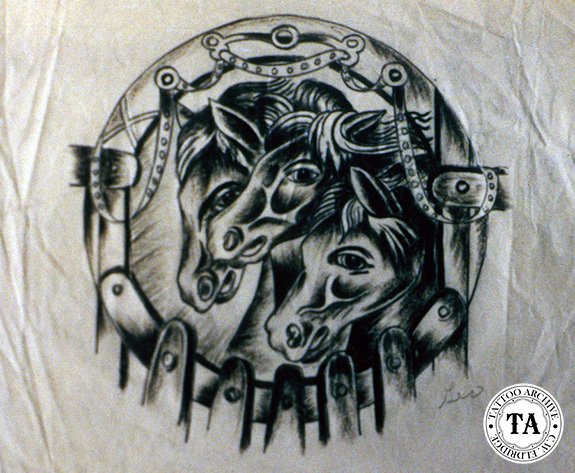 In a letter written in 1925, Fosdick talked about the price paid for tattooing in the 1920s. "The average cost of a tattooed man is around $300.00, $175.00 to the waist and $125.00 for the legs." Fosdick set up shop in several locations in Portland Oregon and Seattle, Washington. In 1924, the Portland city directory listed him at 269½ Burnside. A business card from that era, where he shared a shop with Prof. Bert Grimm, lists his name as "Sailor" George and Prof. G. Fosdick. 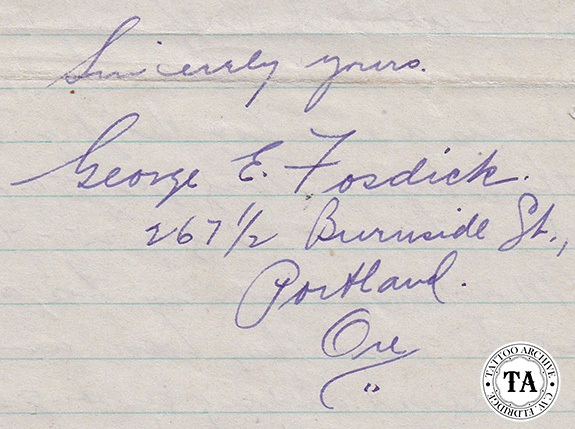 Letters and business cards in the Archive's collection which date back to the 1920s, show Fosdick working alone at 267½ Burnside, just a couple of doors down the street, and indicate that he had been in Portland since 1909. There were no listings for Fosdick in the Portland city directory in the 1930s. Seen below is Fosdick's signature from 267 1/2 Burnside. Seattle directories for 1935 and 1936 list Fosdick working at 423 2nd Avenue. In another letter dated July 1939, written to Fred Marquand, Fosdick announces; "Sailor George is back in business again." Fosdick's return address at that time was 319 W. Burnside, Portland. Larsen Waldemar, better known as "Sailor" Walter Larson, was listed in the 1936 city directory at 319 Burnside. Larson and George worked there together in 1940, and Fosdick occupied the space, working alone, from 1941 to 1943. In a 1924 news article, Fosdick declared: "Father had a large family, money was not plentiful, so early in life I had to fend for myself. For a time I followed the sea; then later in life I learned the art whose age nobody knows." In speaking about Fosdick, Bert Grimm concluded that Fosdick was a paranoid person who shunned publicity. This may account for the fact that very few photographs of Fosdick exist. Fosdick never mentioned his past and Bert speculated that Fosdick may have been a deserter from the Armed Forces or had some other shadowy past that he kept hidden. Bert Grimm told the story about the time that he and his wife Julie were on the train heading to visit Fosdick. Unfortunately they arrived just after his death. Fosdick's wife Lorena offered Bert the estate, but as Bert told the story, he did not need the gear and advised Lorena to gather it up, put an ad in the local paper and sell it so that she would have something for her future. "Sailor" George Fosdick passed away on February 3, 1946 and services were held at the Chapel of Portland Crematorium, located at SE 14th Street and Bybee. His ashes still remain there. Lorena whom he was married to for many years, lived until the age of 66 and passed away in 1951. 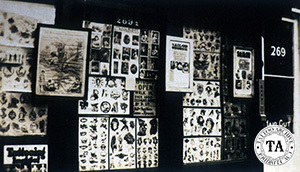 More of George Fosdick's tattoo work can be seen in Kobel photographs #1/125/137/153/176/184/210.